Information security is a reason for concern for all organizations, including those that outsource key business operation to third-party vendors (e.g., SaaS, cloud-computing providers). Rightfully so, since mishandled data—especially by application and network security providers—can leave enterprises vulnerable to attacks, such as data theft, extortion and malware installation. 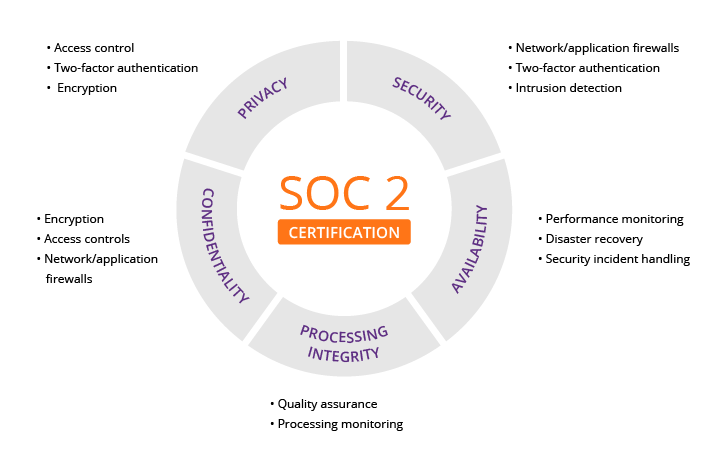 SOC 2 is an auditing procedure that ensures your service providers securely manage your data to protect the interests of your organization and the privacy of its clients. For security-conscious businesses, SOC 2 compliance is a minimal requirement when considering a SaaS provider. Unlike PCI DSS, which has very rigid requirements, SOC 2 reports are unique to each organization. In line with specific business practices, each designs its own controls to comply with one or more of the trust principles. These internal reports provide you (along with regulators, business partners, suppliers, etc.) with important information about how your service provider manages data. Type I describes a vendor’s systems and whether their design is suitable to meet relevant trust principles. Type II details the operational effectiveness of those systems. IT security tools such as network and web application firewalls (WAFs), two factor authentication and intrusion detection are useful in preventing security breaches that can lead to unauthorized access of systems and data. This principle does not address system functionality and usability, but does involve security-related criteria that may affect availability. Monitoring network performance and availability, site failover and security incident handling are critical in this context. However, processing integrity does not necessarily imply data integrity. If data contains errors prior to being input into the system, detecting them is not usually the responsibility of the processing entity. Monitoring of data processing, coupled with quality assurance procedures, can help ensure processing integrity. While SOC 2 compliance isn’t a requirement for SaaS and cloud computing vendors, its role in securing your data cannot be overstated. Imperva undergoes regular audits to ensure the requirements of each of the five trust principles are met and that we remain SOC 2-compliant. Compliance extends to all services we provide, including web application security, DDoS protection, content delivery through our CDN and load balancing.